Most people have heard of (seen? read?) Me Before You (reviewed here), Jojo Moyes’ wrenching novel about Louisa Clarke and Will Traynor, the paraplegic whom she served as a personal companion and who opted for assisted suicide at the end of the book. 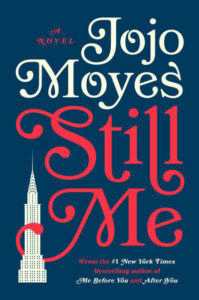 Moyes followed up her bestselling novel with After You (reviewed here), about Lou’s life in England after Will’s death. And the third book in the trilogy, Still Me, takes Lou to New York City, where she is hired to be a companion to a rich woman on the Upper East Side. So here’s the deal with Still Me. It’s not nearly as good as Me Before You, and not as good as After You, but it’s still dependably entertaining Jojo Moyes. She knows how to tell a good story. In this installment, Lou faces her share of challenges and issues, but overall the book punches a much weaker emotional wallop than its predecessors. It’s nice to see Lou gain more confidence and navigate some moral quandaries, and still come through on top in the end. The characters, from enigmatic Agnes to MBA pretty boy Sam, are memorable and occasionally surprising. But you pretty much know that things will end up OK for Lou, and they do. If you’ve read the other two books and you want to see what happens next to Lou, then pick up Still Me. But don’t start off with Still Me – you’ll be missing out on the emotional core of her story. I listened to Still Me on audio, which I recommend. It was narrated by Anna Acton, who narrated After You, and to me, she IS Lou Clarke. She had a slightly hard time with the American accents, but I loved her precise English delivery of the rest of the novel. The story kept me interested throughout, which made for an engaging audiobook. Posted on May 18, 2018 by gayle. This entry was posted in Audiobooks, Fiction and tagged after you, Jojo Moyes, Me Before You, still me. Bookmark the permalink.